Sebaceous carcinoma is an uncommon malign tumor arising from sebaceous glands. Sebaceous carcinoma typically occurs on the eyelid as a slow growing, pink-yellow, painless subcutaneous papule or nodule. Although it is rare, sebaceous carcinoma can also be seen on head, neck, trunk, extremities, breasts, oral mucosa and external genitalia. Sebaceous carcinoma is a locally aggressive tumor, moreover it can metastasize to regional lymph nodes and distant organs. 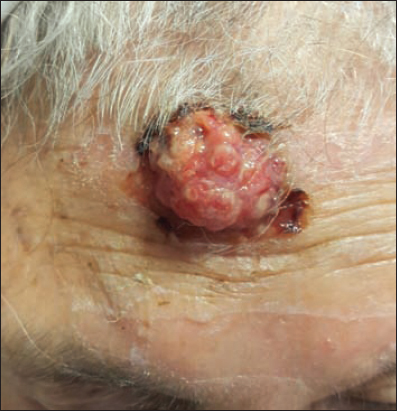 Hereby, we report a 91-year-old Caucasian female with sebaceous carcinoma on the forehead. The extraocular 1,9 cm large sebaceous carcinoma on the forehead was removed surgically with wide local excision under local anesthesia. Sebaceous carcinoma is a malign tumor of sebaceous glands and it is usually found on the eyelid. However, sebaceous carcinoma can arise anywhere in the body where sebaceous glands exist. Extraocular localization of the sebaceous carcinoma is rare and accounts for 25% of all cases. Sebaceous carcinoma is more common in women between the ages of 60 and 70. Moreover, Asian population is more likely to develop sebaceous carcinoma . Sebaceous carcinoma usually presents as a slow growing, painless, pink-yellow papule or subcutaneous nodule . Sebaceous carcinoma is locally aggressive, therefore it may metastasize to regional lymph nodes and also to distant organs . On the other hand, extraocular sebaceous carcinoma is less metastatic compared to ocular sebaceous carcinoma. 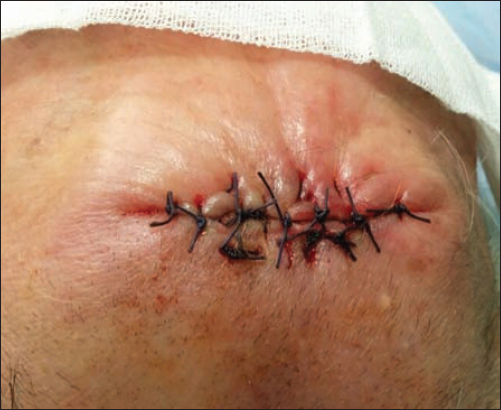 Because of the aggressive behaviour of the tumor, a sebaceous carcinoma should be treated with wide surgical excision . A 91-year-old Caucasian female presented with a solitary mass on the forehead for further evaluation. The patient admitted that the lesion had gradually increased in size in the last 2 years. The physical examination of the patient revealed a painless, immobile, firm, yellow-pink, 2,5×2×1,5 cm ulcerated exophytic mass with irregular surface on the forehead. A wide local excision was performed under local anesthesia. The patient did well postoperatively and she was discharged home the same day without any complications. The histopathological evaluation of the specimen revealed sebaceous carcinoma with the largest size of 1,9 cm. The tumor was removed completely. Deep and lateral surgical margins were free of tumor cells which were confirmed histopathologically. The patient was referred to the medical oncology department for further close follow-up. Figs. 1–4 show pre- and post operative photographic views of the lesion. 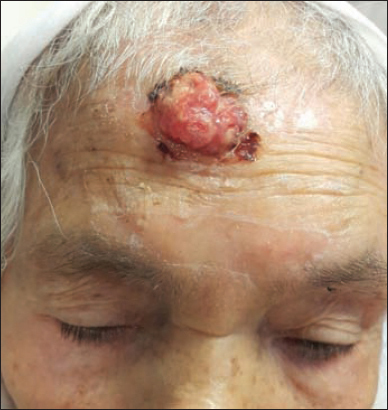 Figure 1: A yellowish-pink, immobile, firm, ulcerated exophytic tumor with irregular surface on the forehead of a 91-year-old female. Figure 2: A yellowish-pink, immobile, firm, ulcerated exophytic tumor with irregular surface on the forehead of a 91-year-old female. Figure 3: Specimen: 2,5×2×1,5 cm. The histopathological evaluation of the specimen revealed sebaceous carcinoma with the largest size of 1,9 cm. Figure 4: The incision was closed primarily. Sebaceous carcinoma is a rare, aggressive tumor which arises from both periorbital meibomian and Zeis glands but also from extraocular sites . Sebaceous carcinoma represents less than 0,1% of all cutaneous malignancies . Moreover, extraocular sebaceous carcinoma accounts for 25% of all sebaceous carcinoma cases. Sebaceous carcinoma can be found on trunk, extremities, external genitalia, breasts, head and neck region such as face, scalp, ears, lips and salivary glands [4,6]. Sebaceous carcinoma presents as firm, painless, pink-yellowish-red subcutaneous nodule or mass which may ulcerate and bleed spontaneously . Risk factors for developing sebaceous carcinoma include older age, history of irradiation, immunosuppression after solid organ transplantation and Muir Torre Syndrome . Muir Torre Syndrome associated with sebaceous carcinoma is an autosomal dominant genodermatosis characterized by sebaceous neoplasms, keratoacanthomas and visceral malignancies . The differential diagnosis of sebaceous carcinoma includes intradermal nevus, chalazion, blepharitis, sebaceous adenoma, basal cell carcinoma and squamous cell carcinoma [4,7]. Histopathological examination is mandatory to reach a definitive diagnosis . Wide local excision is recommended for the treatment of an extraocular sebaceous carcinoma because of the risk of local recurrence. Distant metastasis and mortality have been reported in 20-25% and 20% of all sebaceous carcinoma cases respectively . It has been suggested that Mohs micrographic surgery should be performed to decrease the rate of local recurrence. In elderly patients radiotherapy is the treatment of choice for recurrent tumors and metastatic lesions . The most important prognostic factor for sebaceous carcinoma is early diagnosis. The mortality rate rises from 14% to 38%, if the diagnosis is made after the first six months . The case presented above is a rare example of extraocular sebaceous carcinoma on the forehead. Sebaceous carcinoma has a high metastatic potential, therefore early diagnosis of sebaceous carcinomas is of paramount importance to improve survival. 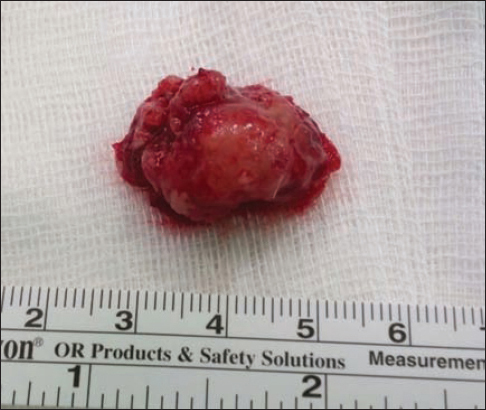 Unfortunately, the presented sebaceous carcinoma lesion reached a size of 1,9 cm within 2 years without medical attention. Therefore, patients should be warned to seek medical attention for any growing cutaneous lesions and sebaceous carcinoma should be kept in mind in the differential diagnosis of cutaneous malignancies of the forehead. The examination of the patient was conducted according to the Declaration of Helsinki principles. 1. Tan O, Ergen D, Arslan R, Sebaceous carcinoma on the scalpDermatol Surg 2006; 32: 1290-3. 2. Kyllo RL, Brady KL, Hurst EA, Sebaceous carcinoma: review of the literatureDermatol Surg 2015; 41: 1-15. 3. Reina RS, Parry E, Aggressive extraocular sebaceous carcinoma in a 52-year-old manDermatol Surg 2006; 32: 1283-6. 4. Pleitz JL, Patel AB, Spires SE, Anderson FL, Aouad RK, A mass on the nasal dorsum. Sebaceous carcinoma (SC) of the noseJAMA Otolaryngol Head Neck Surg 2014; 140: 267-8. 5. Mn R, Sr D, Thulasi V, Shenoy KM, Extraocular sebaceous carcinoma on the chest wall-a case reportJ Clin Diagn Res 2014; 8-ND05-7. 6. Panjwani PK, Tirumalae R, Crasta JA, Manjunath S, Rout P, Extraocular sebaceous carcinoma: a series of three cases with varied presentationDermatol Pract Concept 2012; 2: 39-44. 7. Cieza-Díaz DE, Cano-Martínez N, Barchino-Ortiz L, Longo-Imedio I, Extraocular sebaceous carcinoma: a report of 2 casesActas Dermosifiliogr 2012; 103: 919-22. 8. Grigoryan KV, Leithauser L, Gloster HM, JrAggressive extraocular sebaceous carcinoma recurring after mohs micrographic surgeryCase Rep Oncol Med 2015; 2015: 534176. 9. Torres JS, Amorim AC, Hercules FM, Kac BK, Giant extraocular sebaceous carcinoma: case report and a brief review of a literatureDermatol Online J 2012; 18: 117.